Lars Andersen is a writer and artist in Denmark who developed an interest in historic archery techniques and uses them to get remarkable speed and accuracy. This recent video shows him hitting 3 targets while riding on the back of a Harley. His approach is a departure from the predominant modern style of archery, and draws on ancient techniques employed by Saracen, Native American, Chinese and other bow-slingers of old. 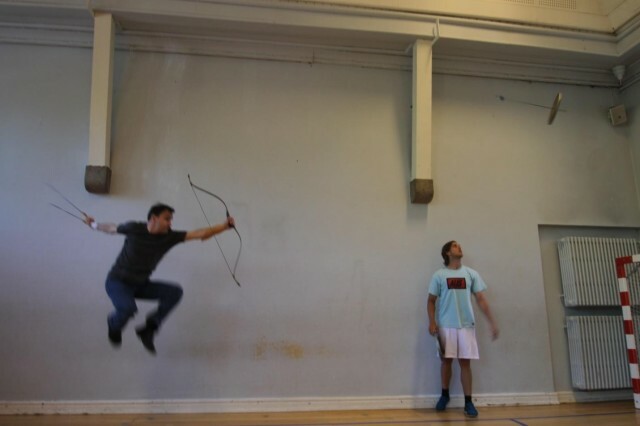 In includes holding arrows in the hand which he says helps enable him to be more instinctive and able to for example shoot arrows while off-balance or jumping in the air. The video below, released a year ago, is a veritable Mythbusters episode with Anderson doing things like firing 3 arrows in 1.5 2 seconds, shooting 11 arrows in the air before the first one hits the ground, shooting faster than the Elven archer Legolas in a Lord of the Rings clip, and more, all narrated by a accidentally comical robotic narration. This interview with OutdoorHub features more about Anderson’s skills and how he learned these ancient techniques.